I recently discovered an Asian store where I had bought some Indian products and one of them was garam masala. The ingredients written on the package I have bought are: Coriander, cumin, pimento,nutmeg, pepper, cardamom, clove, fennel and bay leaves. When I asked my friend Swati, of Sugarcraft in India, if garam masala means spices, she explained to me that it means hot spices (although it is not really hot) be she also sent me her own recipe. “There are many variants, the most traditional mixes use just cinnamon, roasted cumin, caraway seeds, cloves, nutmeg (and/or mace) and green cardamom seed or black cardamom pods. Many commercial mixtures may include more of other less expensive spices and may contain dried red chili peppers, dried garlic, ginger powder, sesame, mustard seeds, turmeric, coriander, bay leaves, star anise and fennel. While commercial garam masala preparations can be bought ready ground, it does not keep well, and soon loses its aroma. Whole spices, which keep fresh much longer, can be ground when needed using a mortar and pestle or electric coffee grinder. Garam masala is used in cooking, but unlike many spices, it is often added at the end of cooking, so that the full aroma is not lost. It is not ‘hot’ in the sense that chillis are, but is fairly pungent. Garam refers to temperature hot, where the word teekha describes the heat of chillis”. So if you want to make your own you can make a combination of these spices. I love the smell of Garam Masala. Roast all the above spices lightly on low-flame for about 2 mins. Now powder them in a clean, dry spice grinder until smooth. Store in an airtight container in a cool, dry place. After making it many times I now add more spices, if I don’t have any of the above such as fennel seeds, caraway seeds or nutmeg. I’m sitting here ROCKING with glee (& embarassment) dear girl…thank you, thank you!! And might I say, that you are my first Greek friend, you are a rocking good foodie,…& lastly, we both share a background of the aviation world !! *Lov ‘n’ hugs* Ivy!! No need to be embarrassed. Did you work in any airline as well? Hope to know more about you.. I love the smell too, and I felt like I almost could smell it from your description. Nice! What a nice thing to say. Thanks Lulu. I am so glad I got to know you .. I really admire the fact that you love trying out new cuisines and enjoy it so much!! A sweetie you are Ivy, and a pleasure it has been to make your acquaintance. Your wish is my command. Thank you very much my friend. I have never attempted to make my own garam masala, in fact, I have only really just discovered it because I have been experimenting a little lately with East Indian cuisine. Thank you my friends for leaving such sweet comments. Bravo to you Ivy! What a great job :D. I’ve only tried moroccon spices once for my pinchos and I liked it. But I’m not used to hot or spicy tastes… don’t know if I would dare with the Indian. Nuria, try this one and you will adore it and there nothing hot in it, only aroma. It’s a simple and essential ingredient in any recipe. 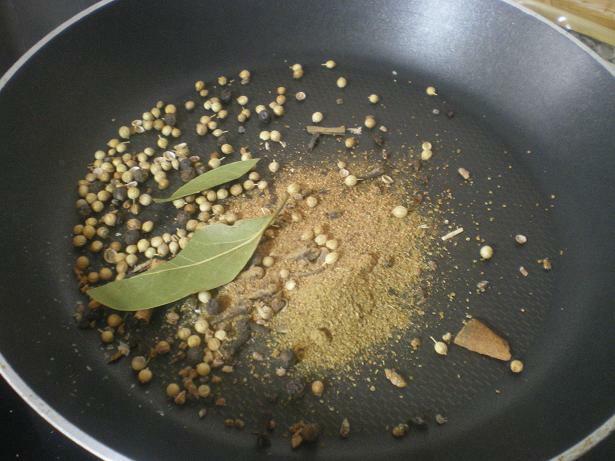 Thank you for sharing, on how to make garam masala in the simplest way.